We have moved, yet again. This time (luckily) we only moved across town, instead of across the country. While I have no tips for moving across country except to not ship anything breakable, ever, I do have some easy ways to stay green if you’re moving somewhere close by. First, you do not need bubble wrap, newspaper, or any packaging materials that will just end up in the trash. Use your clothes instead! I wrapped every glass, dish, picture frame, and even Nana’s china platters in clothes, towels, and sheets that were already coming along. It saves you a ton of excess material waste and cost, is easier, and as long as you are not shipping the boxes (nothing survives shipping no matter how you wrap it), it stays safe. 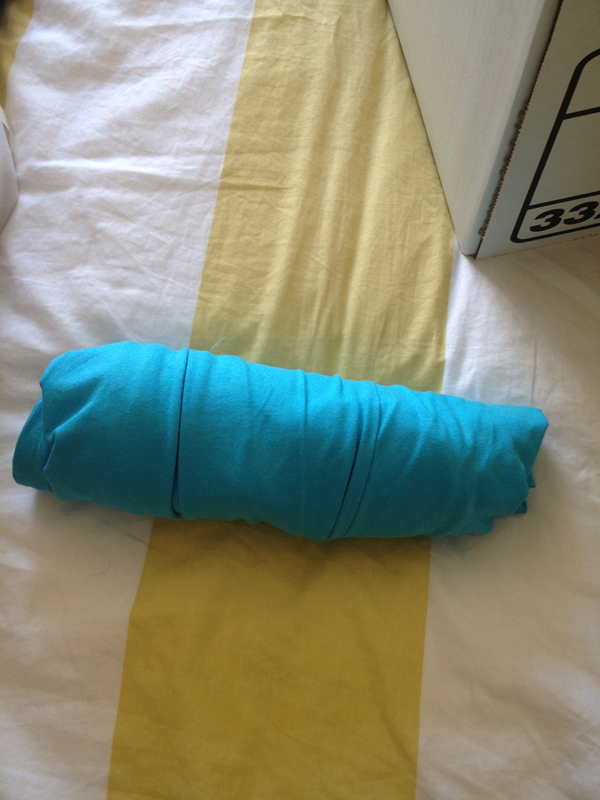 100% of the items we moved across town wrapped in clothes made it perfectly intact. 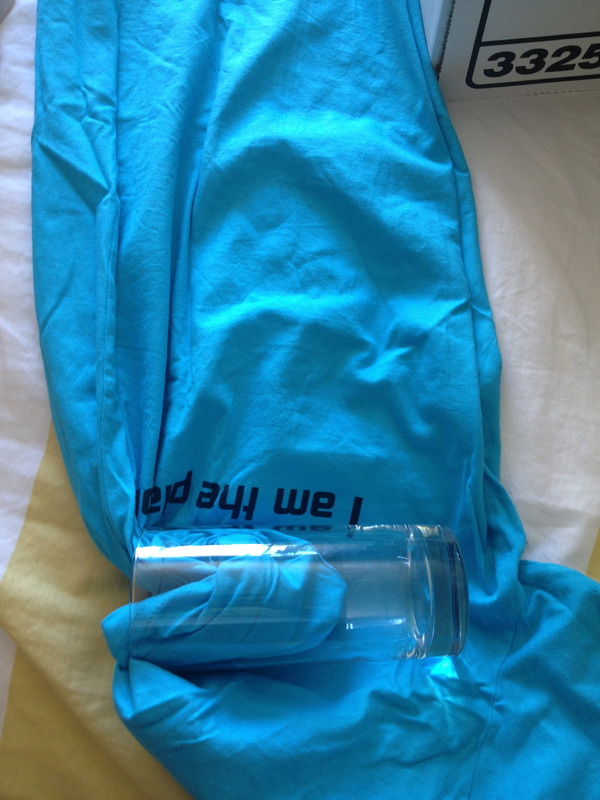 To wrap a glass, I like to use a T-shirt. 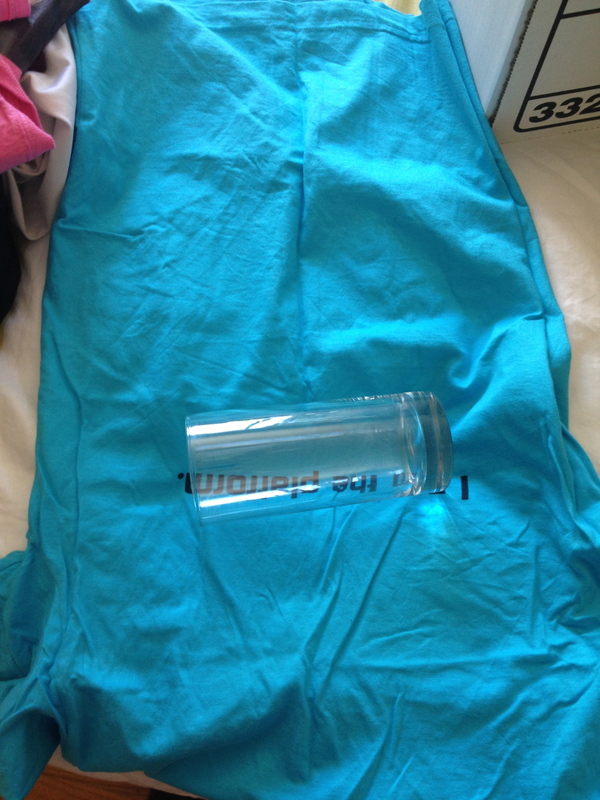 I stick one sleeve inside the glass, then roll the it up. 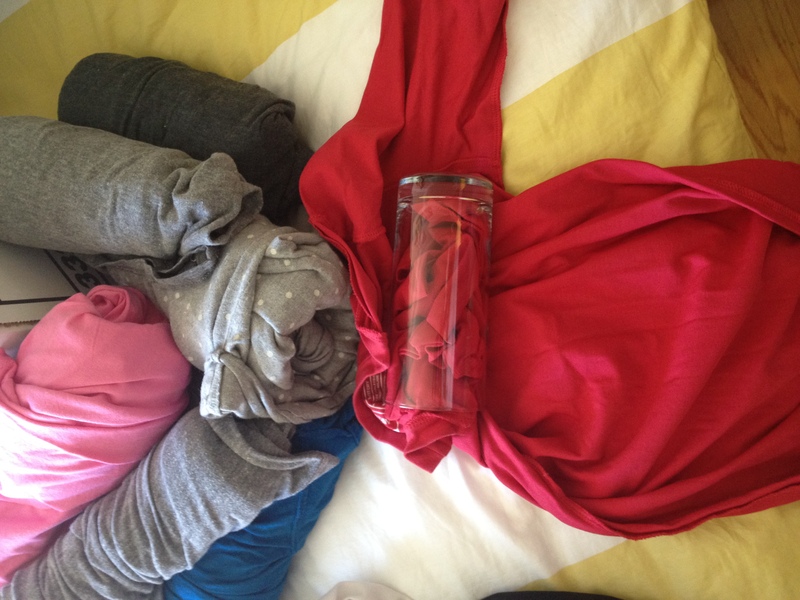 I put jeans or pants in the bottom and top of the box with layers of these T-shirted dishes inside. We also buy bankers boxes that can be reused over and over again instead of shipping boxes. While the previous bankers boxes didn’t make it across country (you can’t ship them because of the handles/top), we used our last ones for 3 moves and storage and know we’ll get a lot of use out of these new ones too. They are 65% post-consumer recycled (the good kind remember!) at Staples. 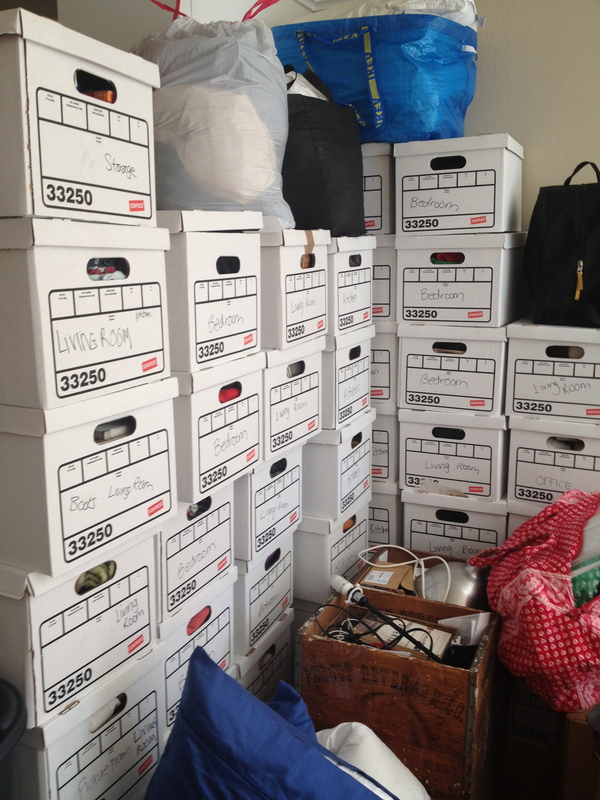 We also labeled them generically as ‘bathroom, bedroom, living room, storage, or kitchen’ as there is almost no chance next time you move you’ll put the same exact things in each box, but you can easily put items from the same room in each box. If you’re moving across town or driving to another state you don’t really need to know what exactly is in each box, only where you should put it. The bankers boxes also fold and unfold for easy storage. We also used reusable bags, boxes, and suitcases that we had around the house and are proud to say we only used 1 garbage bag (I’ve seen some people move with ALL garbage bags) that we then promptly put into our garbage bin to reuse! Moving is also a perfect time for purging and donating what you don’t need to your local reuse center – in our case GoodWill. Those pants you’re saving to wear for that one special occasion that hasn’t happened in 3 years, the shoes that don’t go with anything, and even that frying pan that you bought at Target for $10 but don’t use because you were given really nice pans as a gift – they all will be put to great use by others! Finally day-of details. Instead of borrowing friends cars and moving things piecemeal, we rented a UHaul for $20 and moved everything in one shot (less gas = less pollution = less GHGs). We also hired day laborers from SF Day Labor, a worker-led nonprofit that allows those with barriers to employment (language, education, prior life choices, etc) a place to come together and organize. The nonprofit pays the workers 100% of the dollars we gave them (they keep themselves afloat through grants and private funding), and the workers were fantastic (and cheap!). Two movers for 3 hours each was only $100 total and it felt great to be able to employ a fellow San Franciscan who really wanted to work. Check into these type of organizations (another larger one in SF is Delancy Street which employees only ex-convicts), as you get really reliable people trying to turn their lives around. What better way to support the sustainability of your city or town?